Xploreit maps is an Irish publisher of detailed County maps of Ireland. 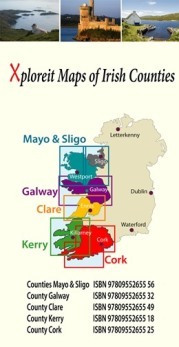 The Xploreit County series covers a number of scenic Irish counties in a set of double-sided, waterproof, rip-proof maps. The maps highlight local and long distance walking trails, cycle routes and scenic drives. The road network includes local secondary roads and tracks with driving distances indicated on the main routes. Parking spots, railway lines and stations, ferry routes, harbors and local airports are included. Topography is shown using 30m contours with woodland areas, mountains, rivers and lakes clearly marked. A large set of symbols shows antiquities, golf courses, museums, heritage centers, tourist information points, beaches for surfing and swimming, campsites, caravan parks and many other local points of interest. GPS compatible latitude and longitude lines at intervals of 5’ and 10’. Many of the maps include a town center plan of the main county town.